Height 5 feet 11 inches. Complexion fair. Eyes grey. Hair brown. Medically unfit for active service, although partially fit for employment in civil life. 8 August 1915 wounded in the foot; 12 August 1915 admitted to Hospital Ship, with gun shot wound to left foot and left arm. Disembarked at Alexandria and 17 August admitted No. 2 Australian General Hospital, Ghezirch, Cairo. 23 September transferred to N.Z. General Hospital at Cairo. 25 September 1915 invalided to N.Z. Son of William (Bill) & Mary Ann (nee MADDEN) FITZGERALD, Timaru. Thomas Aloysius was baptized Catholic on 28 June 1891 at Timaru. 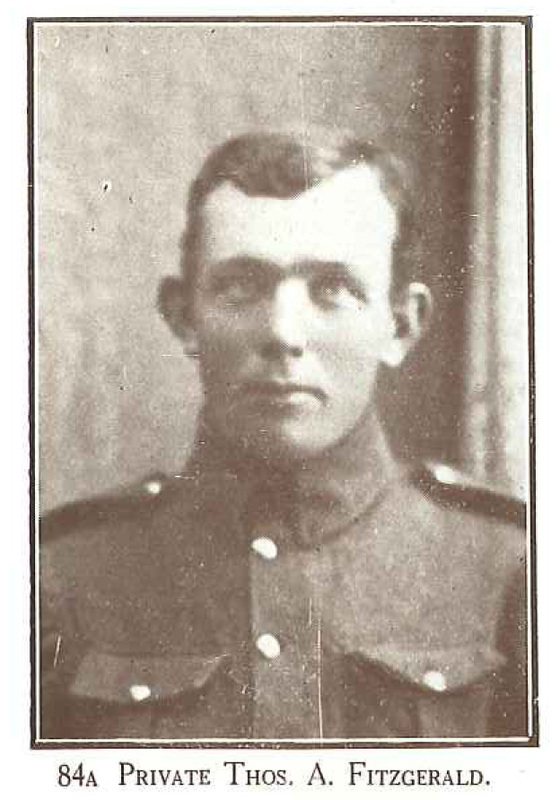 Brother Patrick Gregory FITZGERALD killed in action; brothers John Leo (wounded) & William also served WWI. Thomas probably played in the Celtic football team for the President's Trophy in the Seven-a-Side Tournament on 24 May 1907. One of the first to go to the Front. Invalided to New Zealand per Willochra on 21 September 1915, just five months after embarkation. Gave a total of 1 year and 151 days of service (197 days abroad, 320 days at home). Saw service in Egypt and the Balkans.